Let’s face it, Kanye West’s proposal to Kim Kardashian was never going to be an understated affair. The man who needs a stadium to house his ego and the woman whose entire life is documented through a series of camera lenses (even the bedroom bits) were always going to make a media occasion out of popping the question. So Kanye hired an entire stadium, AT & T Park, home of the San Francisco Giants, for the occasion, and arranged for the couple’s friends and a 50-piece orchestra to be there. 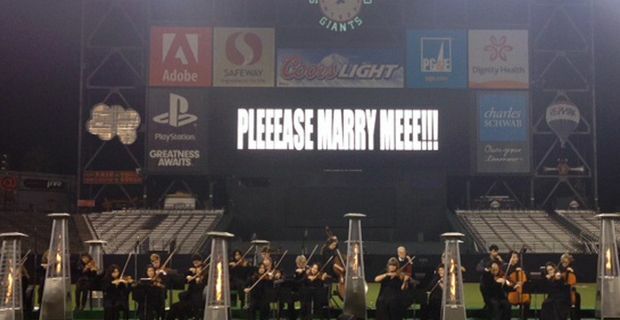 Just in case the moment was in danger of getting intimate, the giant scoreboard read "PLEEEASE MARRY MEEE!!!" although the letters were a little compressed because of Kanye’s overuse of the letter E.
The musical interlude followed, with the orchestra belting out an overture of Lana Del Rey's 'Young and Beautiful' before getting to the main event. Kanye rejected all the various professions of love penned by lesser writers and opted for his own guest rap on the 2009 Keri Hilson hit 'Knock You Down'. You’re not familiar with that slice of poetic genius? Oh, come on. It goes: "They say I move too quick but we can't let this moment pass us / Let the hourglass pass right into ashes / Let the wind blow the ash right before my glasses / So I wrote this love letter right before my classes." Well, maybe you had to be there. The rap’s most distinguishing feature is Kanye resisting the temptation to use the word "asses" in the rhyme scheme. In fact he probably chose the rap because it's one of the few lyrics he has ever written that is vaguely clean. The engagement ring features a 15-carat diamond valued at around £1.5m. Kanye saved $200,000 by blagging free use of the stadium. Kim said yes apparently. Which must have been a relief. Kim Kardashian and Kanye West name their baby... North West!